Agar-digesting bacteria have been hypothesized to cause rottening of the thalli of economically important marine red seaweeds, Gracilariopsis heteroclada Zhang et Xia (Gracilariaceae, Rhodophyta). However, characterization of these causative agents accompanying seaweeds’ disease in the marine environment has been poorly elucidated. Thus, agar-digesting bacteria associated with ‘rottening thallus’ of red seaweed, were isolated and characterized. Agar-digesters were selected based on their ability to digest agar by forming a clear depression around their colony and/or liquefaction of agar. Selected agar-digesters showed a positive result for gelatinase test and arginine dihydrolase test. 16S rRNA of these isolates was successfully extracted, purified, sequenced and analyzed. Phylogenetic analyses showed that bacterial 16S rRNA sequences from rottening seaweed thalli belong to Bacillus spp (98-99%), suggesting that the isolates were significantly associated with the rottening of red seaweeds in the present investigation. Cultivation of seaweed has been practiced worldwide because of its great ecological and economic importance. Studies have shown that these marine plants can be used in bioremediation (Chung et al., 2002; Stirk & van Staden, 2000; Wu et al., 2015; Zhou et al., 2006) of many pollutants such as heavy metals and some inorganic contaminants in the aquatic environment. The continuous increase in the farming of these aquatic plants had gained much attention in many parts of the world. These marine species have been widely used as raw materials for the production of commodities in the market such as food, fertilizers, cosmetics and the like. The demands in the world market for the production of raw seaweeds have overwhelmingly contributed to the development of the seaweed of about 99.6% by quantity to the total aquaculture production of the world in 2008 (FAO, 2010). In 1990’s, most of the seaweed produced came from the group of brown algae and eventually replaced by red seaweed contributing about 50% of the total seaweed production in the year 2010. Many aquaculture activities have seen the potential of red seaweeds to be used in integrated aquaculture system (Butterworth, 2010; Largo, Diola, & Marababol, 2016). One of the most common species of seaweed being utilized using this method is Gracilaria spp. In the Philippines, where aquaculture has been extensively practiced, the potential of these seaweeds in the biomonitoring had been evaluated to improve the water quality by reducing the number of pathogens (e.g. luminous bacteria) in the shrimp culture (Tendencia & De La Peña, 2010). However, in some cases the occurrence of etiologic agents such as bacteria and fungi may have affected the quality of the seaweed and eventually decreased its growth and development (de San, 2012; Largo, 2002). The overwhelming decrease in the quality of red seaweeds was attributed to many epiphytic and endophytic bacteria that degrade the seaweed thalli (Largo, 2002; Musa, Najiah, Wei, 2008; Norderhaug, Fredriksen, Nygaard, 2003; Weinberger, Friedlander, Gunkel, 1994) causing a certain disease. For instance, some bacterial agents proven to cause diseases in red seaweeds were Flavobacterium sp. in Porphyra sp. (Kusuda et al., 1992; Sunairi et al., 1995) and Cytophaga sp. and Vibrio sp. in Kappaphycus alvarezii and Eucheuma denticulatum (Largo, 2002; Largo, Fukami, & Nishijima, 1995). Agar-digesting bacteria have the ability to degrade seaweed agar by forming a depression around the colony and/or liquefy the agar (Goresline, 1931; Stanier, 1941). Vibrios isolated from G. heteroclada have shown these characteristics and thought to be the causative agent of ‘rotten thallus syndrome’ (Lavilla-Pitogo, 1992; Martinez & Padilla, 2016). Previously, we identified agar-digesting bacteria as Vibrio alginolyticus and Vibrio parahaemolyticus. The present investigations aimed to characterize other groups of agar-digesting bacteria associated with the rotten thallus of G. heteroclada using biochemical and molecular methods. 16S rRNA amplicon sequences of the isolates were analyzed and their close associations with rottening of thalli of these red seaweeds were identified. Culture media was prepared by following previous isolation procedure for agar-digesting bacteria (Martinez & Padilla, 2016). Nutrient agar (NA+) with 1.5% NaCl was prepared prior to culture and isolation procedures. After autoclaving the media at 121°C at 15 psi in 15 minutes, about 25-35 ml of NA+ was poured to each sterile petri plates and solidified at ambient temperature (28°C). Three (3) replicates of petri plates containing NA+ medium, were prepared to culture bacteria from both healthy and unhealthy (rottening) seaweed thalli separately. Aseptic techniques were followed in performing all procedures. The seaweed materials were freshly collected from wild stock at Leganes, Iloilo, Central Philippines. About 1cm of wet algal materials from both healthy and rottening thalli were separately cut using a sterile scalpel. The healthy and unhealthy seaweed thalli were directly rubbed on prepared NA+ plates for growth and isolation of bacteria. Cultures were incubated at ambient temperature (28°C) for 24 hrs. 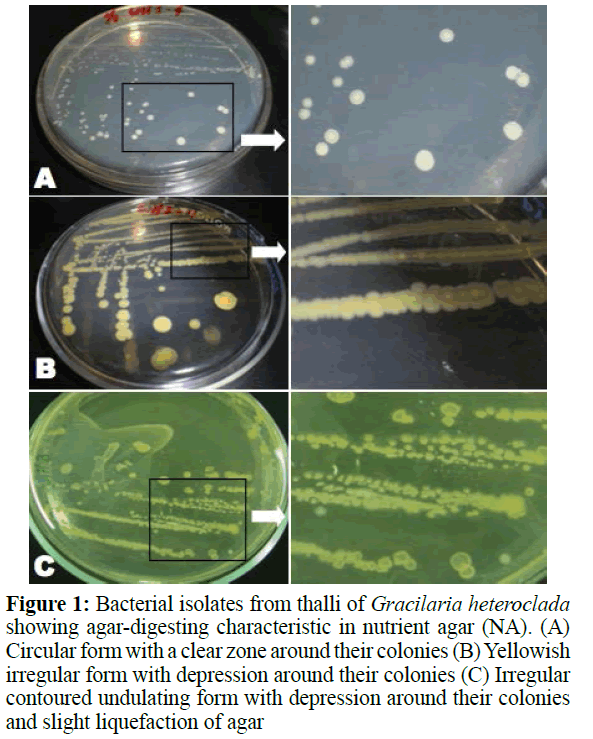 Bacterial isolation: Bacteria showing agar-digesting characteristics (depression around the colony and/or liquefaction of agar) (Goresline, 1931; Martinez & Padilla, 2016; Stanier, 1941) on NA+ plates after 24-hr incubation were recultured to another set of plates with agar media (NA+). Various colonies showing different morphological characteristics were also classified and marked for reculturing including plates streaked with samples of healthy thalli. Gram-staining: Pure cultures of isolates taken from both healthy and rotten thalli were subjected separately to Gramstaining following procedures of Martinez & Padilla (2016). Gram-stained isolates were examined under the microscope (Olympus BX51) at 1000X magnification and photographed using Digital Camera (Samsung). Biochemical characterization: Bacterial isolates were characterized based on biochemical activity using API 20E kit (BioMerieux) which containing programmed software for identification. Pure culture (24-h culture) of bacterial isolates was prepared following manufacturer’s manual. Color change was observed after 24-h of incubation at (28°C) indicating positive or negative results of the 20 different biochemical tests included in the kit. Molecular characterization: Genomic DNA of the agardigesting bacteria was isolated following the manufacturer’s instructions in DNAzol kit (Invitrogen). Reproducibility of DNA was determined by polymerase chain reaction (PCR). Good quality of DNA among bacterial isolates was confirmed by spectrophotometry and gel electrophoresis. Amplification of bacterial DNA extracts with control (distilled water) was done using 0.5 μM general primers namely, 27F and 1522R. DNA extracts of the isolates were sent to a colleague at Bodo University College, Norway, for purification and 16S rRNA sequencing. Nucleotide sequences of the isolates were entered into the BLAST programs of the National Center for Biotechnology Information (NCBI) and compared to their closest affiliation from the Gen-Bank. 16S rRNA sequences of the isolates and the reference bacteria from the Gen-Bank were aligned and the matrices of the evolutionary distance were performed using Clustal W program in MEGA6 Software (Tamura, Stecher, Peterson, Filipski, & Kumar, 2013). A phylogenetic tree was constructed from the evolutionary distance using the same software (MEGA 6). Morphological characterization of the isolated bacteria was done based on colony and pigmentation on nutrient (NA+) agar. Figure 1 show the bacterial cultures isolated from the seaweeds that developed a whitish to yellowish pigmentation on NA+ agar. Most of these isolates developed a depression around the colonies and/or liquefied the agar medium. These were identified as agar-digesting bacteria, which were also isolated from diseased Kappaphycus alvarezii and Eucheuma denticulatum (Largo et al., 1995) and Gracilaria spp. (Lavilla-Pitogo, 1992; Martinez & Padilla, 2016) from previous studies. Agar-digesters had the capacity to dissolve seaweed agar (Goresline, 1931). Liquefaction of the medium could be attributed to the process of digestion of agar polysaccharide matrices by bacteria, which could release water in the process. This agar-digesting mechanism could be associated to the rottening of the seaweed thalli in the present study. The degradation of the seaweed thalli could be initiated by the enzymes produced by bacteria causing biotransformation (Goecke, Labes, Wiese, & Imhoff, 2010), and eventually cause rottening of the thalli in the process of decomposition. Further morphological characterizations using the gramstaining method showed that majority of the isolated species were Gram-positive rods (Figure 2). While previous studies reported on the presence of Gram-negative agar-digesters (Goresline, 1931; Stanier, 1941; Yong, Park, Kim, & Rhee, 2007), the present study disclosed the presence of agar-digesters as Gram-positive bacteria. Relative abundance of Gram-positive bacteria has been implicated in marine samples (Jensen & Fenical, 1995); however, they have not been characterized as agar-digesting bacteria. Interestingly, Gram-negative rods were also isolated from the rottening thalli (Figure 2). Gram-negative vibrios from seaweeds in our previous study showed the same agar-digesting characteristics (Martinez & Padilla, 2016). 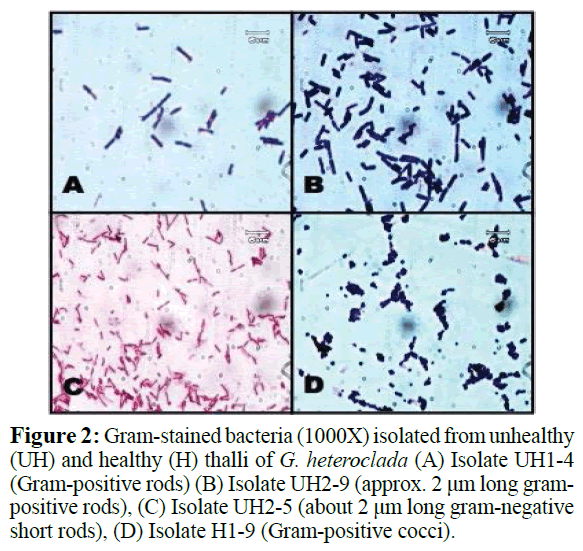 Figure 2: Gram-stained bacteria (1000X) isolated from unhealthy (UH) and healthy (H) thalli of G. heteroclada (A) Isolate UH1-4 (Gram-positive rods) (B) Isolate UH2-9 (approx. 2 μm long grampositive rods), (C) Isolate UH2-5 (about 2 μm long gram-negative short rods), (D) Isolate H1-9 (Gram-positive cocci). Characterization using API20E showed 20 biochemical tests showing characteristics of bacterial isolates (Table 1). These were compared to the tests described by Logan & Berkeley, (1984) on three different Bacillus strains characterized using API system. Out of the five isolates that showed agar-digesting characteristics, four isolates showed a positive test for gelatinase and arginine dihydrolase tests. Arginine dihydrolase catalyzes the hydrolysis of arginine to citrulline. This enzyme has been positively metabolized by many Bacillus spp. tested using thinlayer chromatography (Ottow, 1974). Some Bacillus spp. has been proven to produce gelatinase (Evans & Wardlaw, 1953). Bacteria could have been secreting these enzymes to degrade the cell wall of the algal thallus containing the agar matrix. Although similar characteristics of Bacillus were compared with isolated agar-digesting bacteria, only one isolate (UH1-4) identified as Chryseobacterium indolegenes using an API20E kit with 83% similarity, suggesting that the isolate was distantly related to C. indolegenes. Hence, molecular characterization using 16S rRNA gene was done in order to confirm the identity of the isolates. Table 1: Morphological and biochemical* characteristics of the isolates. A total of 16 bacterial isolates subjected to DNA extraction showed a good quantity using the spectrophotometric method. However, only eight isolates showed a good reproducibility of DNA by PCR. Amplified bands of the 16S rRNA genes in the gel can be observed in Figure 3. All bands were approximately 1.5 kbp of which only 5 of these isolates were successfully sequenced using the universal 16S rRNA primers. Figure 3: Amplified bands of 16S rRNA (approx 1.5-1.8 kbp) of the isolated bacteria from rottening (1, 2, 3, 4, 5, 6, 11, 12, 13, 14) and healthy (7, 8, 9, 10, 15, 16) Gp. heteroclada thalli; (M) ladder. Wang et al. (2009) have proven that 16S rDNA analysis is still an effective tool in differentiating species of bacteria associated with algae, with close genetic relationships. 16S rRNA sequences of the 5 isolates in the current study were compared with the Genbank database using Basic Local Alignment Search Tool (BLAST) analysis. Analyses of the 16S rRNA sequences showed that majority of the sequences were 97-99% similar with Bacillus species (Figure 4). Bacillus sp. was reported to be associated in some seaweed (Singh, Mantri, Reddy, & Jha, 2011) aside from other heterotrophic bacteria that were found to inhabit the surfaces of the seaweeds (Lakshmanaperumalsamy & Purushothaman, 1982). The previous investigation on the inoculation of Bacillus sp. in the degradation of seaweed was found to be effective as it initiates the composting process (Tang et al., 2007). Seaweed branches contained organic substances that attract the bacteria (Musa and Wei, 2008) but the interaction might have caused the bacteria to proliferate and initiated the whitening of the thalli that eventually cause rottening in the process of decomposition. Figure 4: The evolutionary history was inferred using the Neighbor-Joining method (Saitou & Nei, 1987). The optimal tree with the sum of branch length=1.79 is shown. The percentage of replicate trees in which the associated taxa clustered together in the bootstrap test (1000 replicates) is shown next to the branches (Felsenstein, 1985). The tree is drawn to scale, with branch lengths in the same units as those of the evolutionary distances used to infer the phylogenetic tree. The evolutionary distances were computed using the p-distance method (Nei & Kumar, 2000) and are in the units of the number of base differences per site. The analysis involved 18 nucleotide sequences. All positions containing gaps and missing data were eliminated. There were a total of 239 positions in the final dataset. Evolutionary analyses were conducted in MEGA6 (Tamura et al., 2013). (Red mark- isolates from whitening/rottening thalli; black mark- isolate from healthy thalli). The sequences of the agar-digesting isolates in this study were analyzed by aligning the sequences using Clustal W and by constructing a phylogenetic tree comparing the sequences of bacteria with the nearest similarity in the BLAST (Figure 4). The isolates formed three clades in the phylogenetic tree: two groups belonging to Bacillus species while the other group was phylogenetically related to Staphylococcus species. Most of the isolates closely related to Bacillus species were isolated from rottening thalli suggesting that these agar-digesting bacteria might have initiated the whitening and eventual rottening of the seaweed thalli. 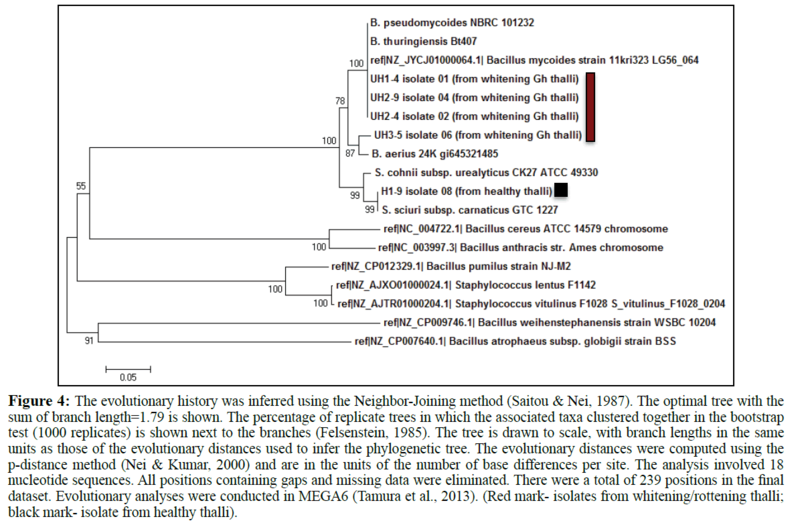 Isolates 01 (UH1-4), 02 (UH2-4) and 04 (UH2-9) were in the same clade as Bacillus mycoides and Bacillus pseudomycoides (Figure 3). These are aerobic, spore-forming, non-motile, gram-positive organisms were previously characterized to be phenotypically similar but later distinguished as two separate taxa based on their fatty acid composition (Nakamura, 1998). The taxonomy of B. mycoides, B. thuringiensis and B. cereus were previously clarified based on DNA relatedness (Nakamura & Jackson, 1995). B. thuringiensis and B. cereus were found to be genetically related but taxonomically separate entities while B. mycoides was distantly related with B. cereus group based on their fatty acid profiles (Nakamura, 1998). UH3-5 isolate 06 belongs to another clade with Bacillus aerius but is distantly related with 87% similarity suggesting that these bacteria might be a novel species. Isolate H1-9 (Figure 3), black mark in the tree) coming from healthy thalli, on the other hand, had 99% similarity with Staphylococcus sciuri subsp. carnaticus. These results further support the hypothesis that Bacillus species isolated and identified only from unhealthy thalli could be responsible for the initiation of whitening characteristics of seaweed branches that eventually developed rottening. However, factors affecting this initiation mechanism could not be explained in the present study. Further investigations to ascertain the role of the agar-digesting bacteria in the rottening of the thalli in relation to other environmental factors could be carried out. Gram-positive agar-digesting bacteria from unhealthy thalli in the present investigation were isolated and characterized using morphological, biochemical and molecular methods. 16S rRNA gene sequences identified agar-digesting bacteria from rottening thalli as Bacillus species while bacteria from healthy thalli were characteristically Gram-positive cocci and identified as Staphylococcus. Although there were numerous agar-digesting bacteria present in red seaweed, further studies need to be done to ascertain the role of these bacteria in the thalli of seaweed in concomitance with some environmental conditions. The authors would like to thank the University of the Philippines Visayas (Office of the Vice Chancellor for Research and Extension) and the University of St. La Salle Bacolod (University Research Center) for the financial assistance. We would like to thank Dr. Christopher Caipang for his help in 16S rRNA sequencing. Butterworth, A. (2010) Integrated Multi-Trophic Aquaculture systems incorporating abalone and seaweeds. Global Focus 914. Chung, I.K., Kang, Y.H., Yarish, C., Kraemer, G.P., Lee, J.A. (2002) Application of Seaweed Cultivation to the Bioremediation of Nutrient-Rich Effluent. Algae 17, 187-194.
de San, M. (2012) The Farming of Seaweeds. Smart Fish Programme Report.European Union. Evans, D.G.,Wardlaw, A.C. (1953). Gelatinase and Collagenase Production by certain Species of Bacillus. Journal of General Microbiol8, 481-487. FAO. 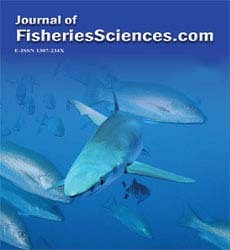 (2010)The state of world fisheries and aquaculture. Food and Agriculture Organization of the United Nations218. Felsenstein, J. (1985) Confidence limits on phylogenies: an approach using the bootstrap. Evolution 39, 783-791. Goecke, F., Labes, A., Wiese, J., Imhoff, J.F. (2010) Review chemical interactions between Marine macroalgae and bacteria. Marine Ecology Progress Series 409, 267-300. Goresline, H.E. (1931) Studies on agar digesting bacteria. Iowa State College. Jensen, P.R., Fenical, W. (1995)The relative abundance and seawater requirements of gram-positive bacteria in near-shore tropical marine samples. Microbial Ecol29, 249-257. Kusuda, R., Kawai, K.,Salati, F., Kawamura, Y., Yamashita, Y. (1992) Characteristics of Flavobacterium sp. Causing “Suminori” disease in Cultivated Porphyra. Lakshmanaperumalsamy, P., Purushothaman, A. (1982) Heterotrophic bacteria associated with seaweed. Proceedings of the Indian Academy of Sciences. Largo, D.B. (2002)Recent developments in seaweed diseases. Proceedings of the National Seaweed Planning Workshop Held on August 2-3, 2001, SEAFDEC Aquaculture Department, Tigbauan, Iloilo pp: 35-42. Largo, D.B., Diola, A.G., Marababol, M.S. (2016) Development of an integrated multi-trophic aquaculture (IMTA) system for tropical marine species in southern cebu, Central Philippines. Aquaculture Reports. Largo, D.B., Fukami, K., Nishijima, T. (1995) Occasional pathogenic bacteria promoting ice-ice disease in the carrageenan-producing red algae Kappaphycus alvarezii and Eucheuma denticulatum (Solieriaceae, Gigartinales, Rhodophyta). J Applied Phycol7, 545-554. Lavilla-Pitogo, C.R. (1992) Agar-digesting bacteria associated with “rotten thallus syndrome” of Gracilaria sp. Aquaculture 102, 1-7. Logan, N.A., Berkeley, R.C. (1984) Identification of Bacillus strains using the API system. J General Microbiol130, 1871-1882. Martinez, J.N., Padilla, P.I.P. (2016) Isolation and Characterization of Agar-Digesting Vibrio species from the Rotten Thallus of Gracilariopsis heteroclada Zhang et Xia. Marine Environmental Res119, 156-160. Musa, N., Wei, L.S. (2008) Bacteria attached on cultured seaweed Gracilaria changii at MengabangTelipot, Terengganu. Academic J Plant Sci. Nakamura, L.K. (1998) Bacillus pseudomycoides sp. nov. International JSystematic Bacteriol48, 1031-1035. Nakamura, L.K., Jackson, M.A. (1995) Clarification of the Taxonomy of Bacillus mycoides. International J Systematic Bacteriol45, 46-49. Nei, M., Kumar, S. (2000) Molecular Evolution and Phylogenetics.OXFORD University Press. Norderhaug, K.M., Fredriksen, S., Nygaard, K. (2003) To Kelp Forest Consumers and the Importance of Bacterial Degradation To Food Quality. Marine Ecology Progress Series 255, 135-144. Ottow, J.C.G. (1974) Arginine Dihydrolase Activity in Species of the Genus Bacillus Revealed by Thin-layer Chromatography. J General Microbiol84, 209-213. Saitou, N., Nei, M. (1987) The neighbour-joining method: a new method for reconstructing phylogenetic trees. Molecular Biology and Evolution 4, 406-425. Singh, R.P., Mantri, V.A., Reddy, C.R.K., Jha, B. (2011) Isolation of seaweed-associated bacteria and their morphogenesis-inducing capability in axenic cultures of the green alga Ulvafasciata. Aquatic Biol12, 13-21. Stanier, R.Y. (1941) Studies on marine agar digesting bacteria. University of California at Los Angeles, California. Stirk, W.A., van Staden, J. (2000) Removal of heavy Metals from Solution Using Dried Brown Seaweed Material.Botanica Marina43, 467-473. Sunairi, M., Tsuchiya, H., Tsuchiya, T., Omura, Y., Koyanagi, Y, et al. (1995) Isolation of a bacterium that causes anaaki disease of the red algae Porphyra yezoensis. J Applied Bacteriology 79, 225-229. Tamura, K., Stecher, G., Peterson, D., Filipski, A., Kumar, S. (2013) MEGA6: Molecular evolutionary genetics analysis version 6.0. Molecular Biol and Evol30, 2725-2729. Tang, J.C., Wei, J.H., Maeda, K., Kawai, H., Zhou, Q, et al. (2007) Degradation of the seaweed wakame (Undaria pinnatifida) by a composting process with the inoculation of Bacillus sp. HR6. BiocontrolSci12, 47–54. Tendencia, E.A., De La Peña, M.R. (2010) Potentials of Kappaphycus striatum (Schnitz) and Gracilariaheteroclada Zhang (Ad Xia) to control the growth of luminous bacteria Vibrio harveyi. Philippine Agricultural Scientist 93, 109-115. Weinberger, F., Friedlander, M., Gunkel, W. (1994) A bacterial facultative parasite of Gracilaria conferta. Diseases of Aquatic Organisms 18, 135-141. Wu, H., Huo, Y., Han, F., Liu, Y., He, P. (2015) Bioremediation using Gracilaria chouae co-cultured with Sparus macrocephalus to manage the nitrogen and phosphorous balance in an IMTA system in Xiangshan Bay, China. Marine Pollution Bulletin. Yong, J.J., Park, S.J., Kim, H.J., Rhee, S.K. (2007) Glaciecolaagarilytica sp. nov., an agar-digesting marine bacterium from the East Sea, Korea. International Journal of Systematic and Evolutionary Microbiology 57, 951-953. Zhou, Y., Yang, H., Hu, H., Liu, Y., Mao, Y. et al. (2006) Bioremediation potential of the macroalga Gracilarialemaneiformis (Rhodophyta) integrated into fed fish culture in coastal waters of north China. Aquaculture 252, 264-276.